Former Vice President, Atiku Abubakar on Friday broke down in tears when receiving the Peoples Democratic Party (PDP) nomination form from his supporters. The supporters purchased the nomination form and presented it to him at the campaign office in Abuja, asking him to contest for the 2019 Presidential election. According to them, the purchase of the form is an expression of their commitment to support his Presidential election bid. 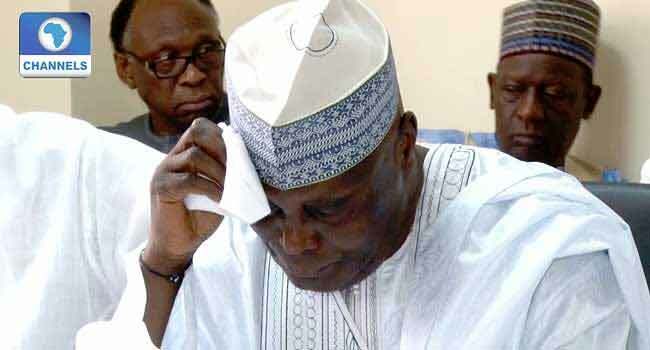 Atiku while responding broke down in tears and had to reach for his white handkerchief to wipe the tears from his face. He said he was surprised at the show of love from the group for coming together to purchase the form without his knowledge. “And believe me, addressing those challenges is possible because we have brought young men and women, Nigerians who have got the talents, who have got the education, who have got the experience, who have got all and what it takes to honestly turn this country around. “Putting together such talented young Nigerians requires leadership and it is that leadership we have not been fortunate enough to have on a consistent basis, that has prevented this country from taking her rightful position in Africa and indeed, the world,” he said. Atiku Abubakar is vying for the office of the President come 2019 on the platform of the Peoples Democratic Party (PDP).